Two tank two location boat dives. See turtles, tropical fish and octopus. Maximum group size is four divers. 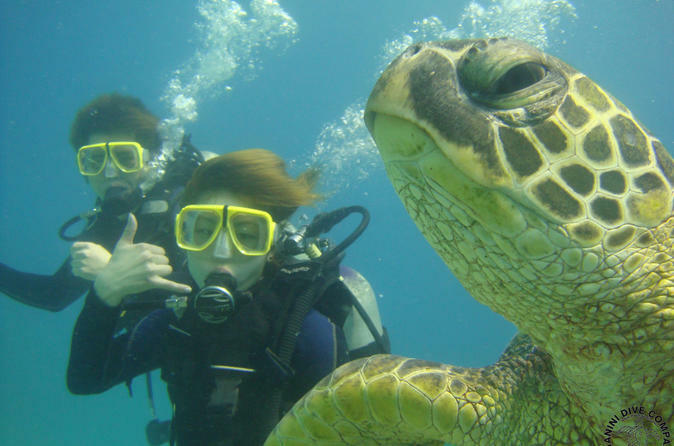 Manini Dive Company Hawaii is a small company focused on Safety, Quality and Fun. We will pick you up from your Waikiki Hotel and take you on a short ride to Kewalo Basin where we will board our boat and head out for a two tank two location dive. We will see Turtles, colorful Tropical Fish and Octopus. On occasion we see Dolphins and in the winter months we can see Humpback Whales. All your scuba gear will be provided for you. Your PADI Certified Instructor will give you a fact filled briefing about your dive sights and what you can expect to see. By keeping our group size to four divers maximum you will receive personalized service and your instructor might even tell some corny jokes.